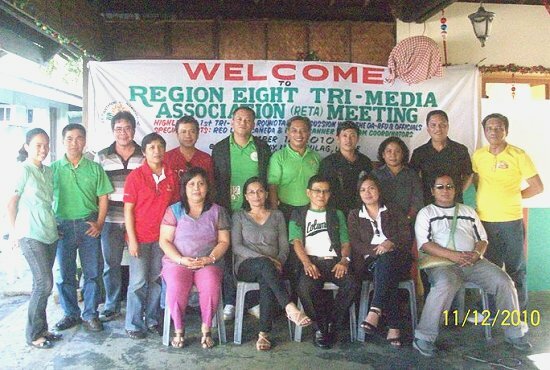 CATBALOGAN, Samar – The Department of Agriculture with RED Leo Cañeda, pioneered a media roundtable discussion with members of Region Eight Tri-Media Association (RETA) in Brgy. Luan, Dulag, Leyte. The whole day activity did a briefing/presentation on Eastern Visayas’ Agricultural Development Status and Strategic Directions. As part of the DA Resource Team, Mr. Rufino B. Ayaso, Dr. Veronica Berenguer, Dr. Anthea Naputo and Mr. Fabian S. Aldiano were in attendace. On the other hand, various media outlets in Region 8 were duly represented. The RETA Roundtable Discussion is just one of the projects initiated by the newly organized media association in Eastern Visayas in its effort to provide factual developmental information to its populace. On the Regional Rice Program updates, the Department of Agriculture targets a 5% increased palay production annually. It also projects to attain self-sufficiency on rice production by 2013 where presently, the three Samar provinces are under a sufficiency threshold which is lower than 100%. Furthermore, it is expected that the region could at least contribute to the national palay production in an average of 5.45% annually. Statistics reveal that the rice sufficiency index for 2010 was reduced by 14%, having recorded 106% in 2010 compared to last year’s 120%. On the other hand, a remarkable increase from 113% in 2009 to 127.24%in 2010 in the per capita consumption of rice was attributed for such increase. According to Dir. Cañeda, the increase in per capita consumption is reflective of an improved quality eating habits of the people. It would also mean that an available supply of such commodity is affordable. In response to the public criticisms that the DA has been presenting unrealistic reports, the Director made it clear that Region 8 is a “surplus rice producing region” at 120% self sufficiency. “From the soil, we have enough. Rice seeks its own level. In fact, we are feeding Region 7 with most of our rice products brought by our traders outside the Region. Rice is a political commodity. We must remember that we are in a market-driven economy. Considering that we are in a democracy and on a free enterprise, we cannot just stop these people from bringing our products outside the region,” explains Cañeda. Meanwhile, DA announced that out of the 68 greenhouse units in Eastern Visayas, Samar is lucky to have the biggest functional greenhouses engaged solely in organic farming in the country. The director is referring to the newly inaugurated greenhouse in Brgy. Limarayon,Calbayog city, which is being effectively managed by the Social Action Center of the Diocese of Calbayog. Organic farming is encouraged for being cost effective and for having less contaminated products. On vegetable production, the region has not come to par yet with 14 kilo-per-person annual consumption. DA advocates for more vegetable production to address health and malnutrition. Likewise, fruit production on six (6) products has negative growth rates due to climate change. Furthermore, DA reports on various livestock programs such as the continuous artificial inseminations. It was worth noting that Samar has the most number of Carabaos from among the regions. People use carabaos in farming and at the same time as carabeef which is proven to have less cholesterol content. No animal outbreaks were reported. Dir Leo Cañeda is hopeful that the inclusion of Samar, as a priority, in the hunger mitigation programs of the government will improve the lives of the Samareños. Other programs include Rapid Seed Supply Financing Project (RaSSFip), Irrigated Rice Production Enhancement Program (IRPEP) and other LGU Initiatives. DA acknowledged the support of Calbayog, Sta Rita and the Provincial Government of Samar for committing P6,959,600 as its financial counterpart on various DA programs. The discussion ended with a forged partnership between the DA and the RETA in ensuring that DA services are delivered effectively. Dir. Cañeda assured the group of the DA’s transparency efforts. In this regard, he considered creating a DA Regional Website that would publish updates on ongoing programs. QUEZON CITY – A women’s organization tells the Bishops to stop worrying about going to jail because of their opposition to the Reproductive Health (RH) Bill. “We believe that the bill’s passage is imminent. This is long overdue. Poor women continue to die of preventable pregnancy and childbirth complications. In the DSWP alone, we lost a number of our members because of these. There are also those who almost died due to the same causes. These unnecessary deaths and almost-deaths must end,” Angsioco concluded. TACLOBAN CITY – Toshiba Information Equipment Philippines Inc., a subsidiary of Toshiba Digital Media Co., made a visit on Saturday to the province of Leyte and met with Governor Carlos Jericho Petilla. The governor hinted, the hard disk drives manufacturer which has its main facility at the Laguna Technopark Special Economic Zone in Sta. Rosa, Laguna, may be looking for possible sites for its expansion. Toshiba Corporation was among those that assured millions in pesos in investment for its electronics products expansion in the Philippines during President Benigno “Noynoy” Aquino III’s visit to Japan where he met with Japanese business leaders before proceeding to the Asia-Pacific Economic Cooperation summit in Yokohama. Reportedly, interest to visit the province was prompted after Leyte was declared as Most Business Friendly province this year, the province’s second after 2008. The governor said, though the purpose of the visit by the Toshiba officials was mainly for courtesy call, he likewise took an opportunity to present the province’s potential as a location for their plant expansion and operation. “I don’t know what they want, we don’t know yet what their plans are but definitely they are looking around for destinations of their plants. I just readily made the presentation just so they would know our place as they look around,” Gov. Petilla said. Toshiba officials who met with the governor were headed by Toshiba Information Equipment Philippines President Yoshiyuki Yano, and included Executive Vice-President Tatsumi Sato, Yamaichi Electronics Co. Ltd. President Shunji Orita, concurrent Board Member of the Philippine Economic Zone Authority Francisco Ferrer. Mr. Charlie Uykim of the Leyte Chamber of Commerce and Industry (LCCI) also escorted the visiting Toshiba officials. Gov. Petilla said he particularly presented to the officials possible sites should they want to expand to Leyte. These possible sites are the Government Center, other private lands in Palo area or at the Leyte Industrial Development Estate (LIDE) In Isabel, Leyte which is the location of two other big companies – PhilPhos and PASAR. Offering a site at the Government Center would form part of the long term plan for this provincial-owned property which is presently the site of government offices, historical landmark, PEZA facility Leyte ICT Park and upcoming four-star resort hotel. Toshiba is a leading global producer of solid state devices (SSDs) and expects to boost its worldwide share in the PC notebook and enterprise drives. SSDs are hard-disk drive-like devices that store data on flash memory instead of on a revolving magnetic disk. Toshiba’s initial export projection is $54.916 million annually. Major markets include the US, Europe, China, Japan, Taiwan and Korea. Toshiba Information Equipment Philippines Inc. has been a PEZA-registered company since September 1995 manufacturing hard disk drives in its Laguna Technopark Special Economic Zone facility in Sta. Rosa, Laguna. CALBAYOG CITY – In observance of Deafness Awareness Week dated November 7-13 this year with the theme “Be a Part…Not Apart,” Christ the King College – Elementary and High School Departments has opened its exhibit room and showcased their handicraft collections to the public. CKC high school deaf-mute interprets the national anthem during the Open House of Deaf Building at the CKC Campus. Deaf-mute adviser Myra Fe Grecia said that all the products displayed were the projects of her pupils/students such as dyed t-shirt, tree straw, plastic tree, rug, soap basket, rug bag, waiving paper, decorated pot/ art, pottery, pyramid, mosaic and charcoal paper. Grecia added that she’s handling 10 elementary and 13 high schools through a multi-grade teaching. There are also three (3) college deaf-mute students taking up education and social work, respectively in same school while four (4) are taking up agriculture at Northwest Samar State University. SpEd (Special Education) Center on the other hand is presently handling 29 deaf-mute pupils according to its adviser Gemma Tapel. In adherence to Presidential Proclamation No. 823 issued on November 8, 1991 and Department of Education Memorandum No. 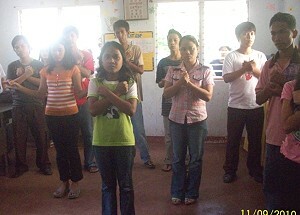 397, s. 2010, CKC has responded to undertake activities such as Sign Language Literacy, Symposium on Health Education, Theater Play “An Pag-ilawud”, Quiz bee and spelling contest and Variety Show. Such undertakings do not only pay tribute to countless individuals who, despite their hearing and other impairments, endeavor to have access to education to improve their share. A kind of support to every effort by bringing them into the mainstream, where they too have a rightful place, and help them to gain access to opportunities to become productive members of the community and the country as a whole. Studies reveal that generally one to three individuals in every 1,000 births suffer from some form of hearing impairment: 90 percent of deaf children are born into families where both parents have hearing impairment; men are more likely to experience hearing loss than women; and there is a strong relationship between age and hearing loss. Since other deaf-mute children/adolescents belong to poor families, Philippine Saint Francis of Assisi Deaf Center was built in Brgy.Carayman this city. While processing its application (to qualify as residence of deaf-mutes) at the Department of Social Welfare and Development-RO 8 Standards Bureau, the center has opened its office under the supervision of Fr. Hozo Sato, OFM. The deaf center hopes to formally open on June next year. CAMP LUKBAN, Catbalogan, Samar – With the intensified campaign against illegal logging in the area as deputized by the Department of Environment and Natural Resources (DENR), combined elements of the 8ID’s 802nd Brigade and 19th Infantry Battalion partnered with the DENR team from Manila seized illegally cut lumbers at Sitio Kusol, Brgy. Liberty, Ormoc City around 10:00 a.m. on November 11. The confiscation took place when the team acted on the information regarding the presence and on-going illegal logging activities in the said area. It counted for about an estimated 2,000 board feet of assorted illegally cut lumbers including Lawaan were seized and lately found out to be owned by a certain Abundio Magno alias Bondoy. The confiscated lumbers are now under the custody of DENR for proper disposition which will also be used to sue appropriate charges to Magno. Meanwhile, Major General Mario Chan, 8ID’s commander commended the members of the team involved in the successful deeds. He said that while 8ID is intensifying its ISO campaign to pursue peace and development in the province, the non-traditional role of the soldiers that will greatly affect the attainment of peace and development will also given equal importance. “Environmental protection and preservation and other non-traditional role bestowed on us is co-equal with our ISO campaign for it also affects our aims to make our province progressive to at least tangent with other neighboring provinces if we can’t abruptly surpass them,” General Chan says. “While we are intensifying our campaign against insurgents, we also intensify our partnership with other active stakeholders in their fight against those who destroy the beauty and prosperity of our province which is detrimental to promote your dreams of having a peaceful and progressive Region 8”, concludes General Chan. CATBALOGAN CITY – The resolution of the annual budget controversy in the province of Samar is getting more complicated with more Temporary Restraining Orders that are being petitioned at the different judicial bodies by both camps. The mess started when the proposed P1.179 Billion 2010 Annual Budget (AO 13-002) of Samar was irregularly or illegally passed on August 26, 2010, as alleged by the majority block of the legislative department of the province. On August 27, a disclaimer which was manifested by seven Board Members was publicly circulated. The validity or legality of the passage of the Appropriation Ordinance 13-002 was formally filed in court with a prayer for the issuance of a Temporary Restraining Order. 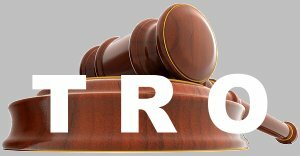 On August 31, 2010, Judge Reynaldo Clemens of RTC Branch 31 found the petitioners’ ground for the issuance of the TRO meritorious pending the resolution of the legality issue. The TRO was made effective within twenty days. Moreover, on September 20, 2010, a Preliminary Injunction that restrained the implementation of AO 13-002 was released while the hearings for its nullification, as petitioned, have been scheduled at Judge Clemen’s sala. Just recently, it was learned that Hon. Reynaldo B. Clemens, Branch 31 Presiding Judge and five other co-respondents of a case docketed as CA-G.R. No. 05422, petitioned the Eighteenth Division of the Court of Appeals in Cebu City to reconsider and set aside the CA Resolution promulgated on October 27, 2010 directing the issuance of a Temporary Restraining Order. The said motion was filed last November 4, 2010. The petitioners pointed out that under the Special Civil Case No. 138, their main prayer is the declaration of nullity of Appropriation Ordinance No. 13-002 on the basis of illegality and irregularities of its passage. Furthermore, it was stressed that prior to the passage of the questioned Appropriation Ordinance, the provincial government of Samar has been operating and conducting its official functions and business under a re-enacted budget. On this account, the provincial government operations remained unhampered and smooth, the petition made it clear. It was also mentioned that during the hearings, the respondents did not move to dissolve the Preliminary Injunction Writ in question, but, opted to proceed to the hearing of the main case. The court’s attention was invited to the fact that the petitioner did not challenge the tenability and relief of the petition and jurisdiction of the RTC in Special Civil Action 138. Moreover, it was evident that the relief prayed for is mainly on annulling, lifting and setting aside of the injunction order dated September 20, 2010. “In other words, the petitioner does not oppose any eventual declaration of nullity of the appropriation ordinance approving the annual budget of the province of Samar, provided that before any such declaration of nullity, she is unrestrained in making disbursements of the people’s money even if the validity of its appropriation is dubious.” explain the petitioners. This, according to them, is not just prejudicial to the higher interests of the province and the people of Samar, but, also, this will cause great and irreparable damage to them. The Order, which was concurred by Executive Justice Portia Alino Hormachuelos and Associate Justice Socorro B. Inting, was issued favorably in behalf of Hon. Share Ann T. Tan, a petitioner for certiorari. It was learned that Tan filed for a very urgent Motion for Issuance of Temporary Restraining Order/Preliminary Injunction and/or Status Quo Ante Order of injunction dated September 20, 2010 as well as for the issuance for a preliminary injunction and/or temporary restraining order enjoining respondent judge from continuing with the hearing of Special Civil Action No. 138 pending resolution of the said petition for certiorari. Furthermore, it specifically mentioned of the non-payment of employees’ benefits such as the Productivity Enhancement Incentive, Step Increment and Representation allowance and Transportation Allowance (RATA) differential both for Calendar Years 2009 and 2010 and the implementation of the magna carta benefits for health workers due to the injunction of the implementation of the 2010 Annual Budget. The cited grounds were found to be meritorious by the court. “Thus, so as to preserve the rights of the parties during the pendency of the instant petition and in order to prevent the judgment that may be promulgated by Us from being rendered moot and ineffectual, a Temporary Restraining Order is hereby issued”, partly states the Resolution. As of this date, court decisions on the various petitions are being monitored by the Samarnons. While both camps insist on the legality of their actions, using public’s interest and welfare as an excuse, people are patiently hoping and waiting that what is due and best for the Samarnons will soon be given. “What we don’t like is that we are most often misled. We are always made as an excuse. The truth is, they will just be serving their own interests. We have always been promised of benefits. Even without the budget, personal services are provided in the re-enacted budget. So, why can’t they give what is due us?“, was an employee’s reaction when made to comment on the matter. 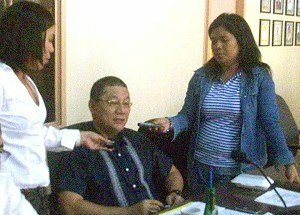 CALBAYOG CITY – To beat the target for submitting the 2011 annual budget, a joint executive-legislative budget hearing is soon to be conducted next week said Calbayog City Councilor Julius Mancol on Monday in an interview with Samarnews during the Sanggunian’s regular session. Mancol added that this was the proposal of Mayor Reynaldo Uy in order to hear and deliberate the budget without any delay. The celebration of Calbayog’s 62nd Charter Day on October 16 and the October 25 Barangay and SK (Sangguniang Kabataan) Elections were the reasons why the budget hearing was deferred. 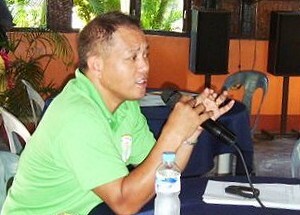 The legislative has less than two months to enact the 2011 P680M annual budget of Calbayog. “An P680M is a conservative budget but we are expecting for an additional. The treasurer just used the figure as his basis para makita kon ikakain ta an excess,” Mancol clarified. Once the budget is approved, all the Tri-District Programs will surely be implemented including those of previous administration such as the bus terminal and public market in Brgy. Bagacay and other proposed projects which were halfway fulfilled. Taking into account the activities conducted last October 16, 2010 where the unveiling of Aguit-itan Development Project was held, ground breaking ceremony at Brgy. Talahib - project site of Calbayog City Hospital, and the MOA signing of public-private partnership between LGU-Calbayog and SOS (Save our Souls) Children’s Village for the establishment of the Family Training Center, all of these were just part of the city government’s Tri-D programs under the CDS (Community Development Strategy) process. At present, the city’s 2011 General Fund Annual Budget is at the committee (Budget Review, Finance and Laws) level. PASAY CITY – Senator Pia S. Cayetano today threw her support solidly behind the 37 professors of the University of the Philippines (UP) College of Law who have been threatened with sanctions by the Supreme Court (SC) after they called for the resignation of a member of the high court over charges of plagiarism. “In the seventies and eighties, it was the voice of activist professors who denounced the excesses of Martial Law that helped keep people’s hopes alive for change and reforms, especially among the youth. It saddens me to see how academic dissent is being suppressed now, at a time when our rights and freedoms have supposedly been restored,” said Cayetano, a lawyer and alumna of the UP College of Law. “As the last bastion of justice, the SC is expected to set the highest standards of integrity, credibility and professionalism. Unfortunately, the high court failed in this respect when it allowed a clear case of plagiarism within its ranks to go unpunished,” she stressed. Cayetano is referring to the SC’s controversial decision in Vinuya vs. Executive Secretary, where several passages from eminent international legal scholars were lifted without proper attribution and used inappropriately in junking the petition of a group of war-time comfort women for the Philippine government to compel Japan to make a public apology and provide compensation. “Plagiarism is a form of dishonesty that is taboo and frowned upon in any self-respecting institution. All our teachers, from grade school to college, have instilled in us the value that lifting works from others without properly acknowledging their source is improper, unethical, and merits grave punishment. Our teachers taught us to be honest, original and creative in our work. But I wonder what values will our young students learn from the questionable actions of the Supreme Court?” she concluded.